Dragging preaching, teaching and communication into the 21st century. This book is for everyone who has to stand up and talk to others and those who have to sit and listen. Packed full of creative ideas, hints and tips for improving talks and sermons, from voice control to effective sermon planning. 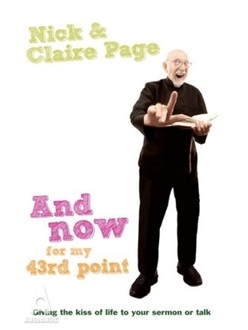 The Pages take a humorous look at the development and current state of the sermon and explore whether the method of preaching and teaching most frequently used – the monologue sermon – is necessarily the best. They question whether the sermon is the only way of teaching, even more, if it is Gods way of doing things. Suggested further reading and further resources and material available from the associated website. You can download the intro from the book here. It’ll give you an idea of what the book’s like. But it also contains a Hogarth illustration, the Sermonator, and Spurgeon’s preaching note written on the back of an envelope. There. Don’t say we’re not good to you. In the book, we talk at several points about the late Steve Jobs. Here’s a video which shows some of the key points about his communication technique.